As the Washington consensus for ‘defending democracy’ in Ukraine against ‘Russian fascism’ Putin-style marches on, I thought it of some relevance to examine the development of federalism or federative democracy under the Maidan regime of President Petro Poroshenko. Federalism is conceptualized as democracy pertaining to territorities and/or communities (ethno-national, religious or both). This means that power in a federal democracy does not rest solely in the nation’s capitol but is dispersed or decentralized to lower-standing administrative-territorial units. This is territorial decentralization. Power and authority can also be delegated through cultural autonomy; that is, from the central or federal government and even territorial or regional and even lower-standing governmental units to communal (ethn0-national or religious) groups, which may or may not be concentrated in any one regional territorial-administrative unit or even several. One characteristic of a federative democracy is the election of the head of the executive branch of any region, state, province, etc. at the local level rather than his appointment by the federal government, no less by one official in the federal government. Thus, as I and many other experts of federalism in Russia argued when in 2004 President Vladimir Putin replaced the selection of regional governors and republic presidents by popular election in the regions with presidential appointment, he undermined democratic federalism in Russia. Although Russia was suffering from what I called ‘hyper-federalism’ – a mix of several types of federalism compounded by unofficial or unconstitutional asymmetry (some regions getting more powers than others) in its hyper-federalism – at the time and needed some streamlining and more central control, repealing gubernatorial elections was not necessary. Dealing with unofficial asymmetrical federalism and perhaps some aspects of official asymmetry would have solved the problem of the hyper-federative overly decentralized system established by Putin’s predecessors and the chaotic processes of perestroika and revolution from above. In addition, at the time not only did Putin appoint ‘Varyags’ or outsiders to governorships in various regions but senators as well. Thus, there was a time when the two senators appointed by Putin to the Republic of Tyva, the titular republic of the Mongolian and largely Buddhist Tyvans, both hailed from St. Petersburg and had never set foot in Tyva before their appointments. This violated another key principle of federative decentralization whereby those ruling or representing regions should be locals, who have long-standing ties to and therefore understand the regions they are serving. Since Putin’s early federative counter-reforms, reforms have once again introduced partially and, in some cases, indirectly the election of governors and senators in Putin’s Russia. Now the West is engaged in its great ‘war of values with Russia’ and defending ‘Ukrainian democracy.’ But in Ukraine governors are appointed by the president and there are no senators or an upper house – another common feature of federalism. This past week saw Ukrainian President Petro Poroshenko appointed a new governor for Ukraine’s southern region of Odessa. Presidential appointment of governors remains constitutional practice, as it did under the recently overthrown Viktor Yanukovich. Poroshenko is not only appointing governors, contrary to democratic federative practice. He is appointing Varyags. He appointed a Varyag on steroids – a foreigner – in the person of former Georgian president Mikheil Saakashvili to be Odessa’s new governor. 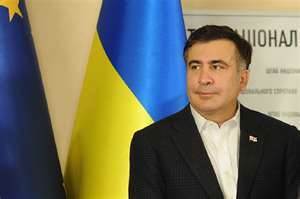 Besides now being a fugitive form Georgian justice, Saakashvili had never lived until Ukraine until a few months ago and never set foot in Odessa until his appointment as governor. Sounds familiar. Odessa is a complex multi-ethnic region with not just Ukrainians and Russians but significant Greek, Tatar, Jewish and other minorities. It was the locale of one of the worst neo-fascist atrocities in Europe since World War Two when on 2 May 2014 groups of neo-fascists and Ukrainian patriotic soccer fans burned alive and otherwise killed 48 and wounded and injured a hundred or so more pro-decentralization, pro-autonomy demonstrators. Saakashvili possesses none of the prerequisites to deal with Odessa in any proper manner. His only credentials seem to be that he despises Putin and Russia and supports Kiev because it despises Putin and Russia. But all this is far from falling outside the framework of the Maidan regime to date. Poroshenko still runs numerous businesses, including owning one of the main central television channels. Positive statements about any aspect of Soviet history or criticism of Ukraine’s World War Two fascist movements are punishable by up to 5 years in prison. Neo-fascist battalions and parties, like those of Right Sector, remain at-large bombing civilians in Donbass, lustrating ‘vatniks’ (derogatory term for ‘Russians’), threatening coups, and having their leader offered a position as advisor to the Ukrainian army’s General Staff. So contravening any semblance of federative democracy is a minor aspect of the Maidan regime’s mounting authoritarian surplus. Nevertheless, it is important and should not go without notice, as it most certainly will in mainstream media, academic, and think tank circles.